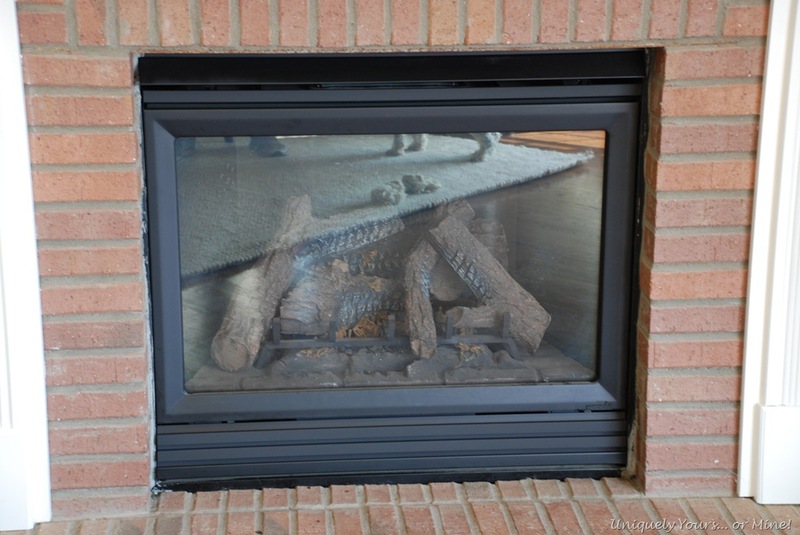 Updating The Fireplace Focal Wall – Uniquely Yours… or Mine! 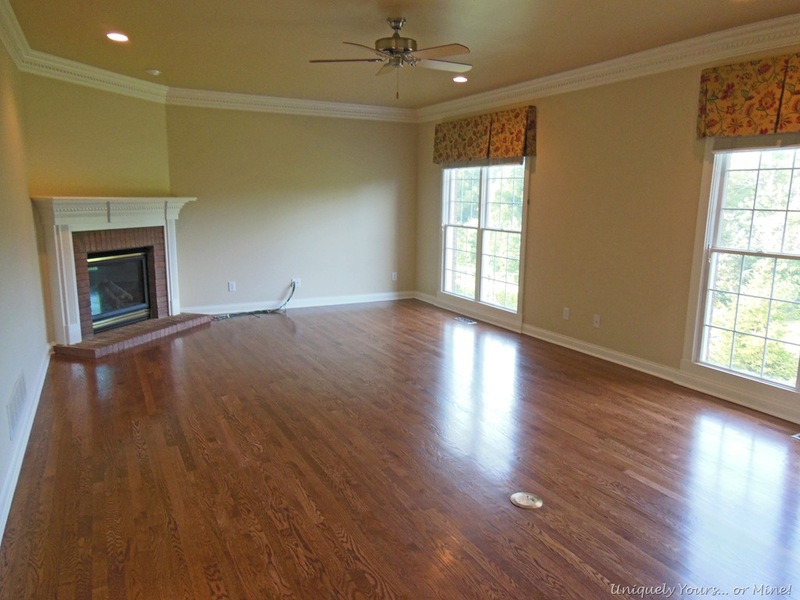 The room itself is pretty long (15Wx24L) with the obvious focal point being the fireplace and TV area. 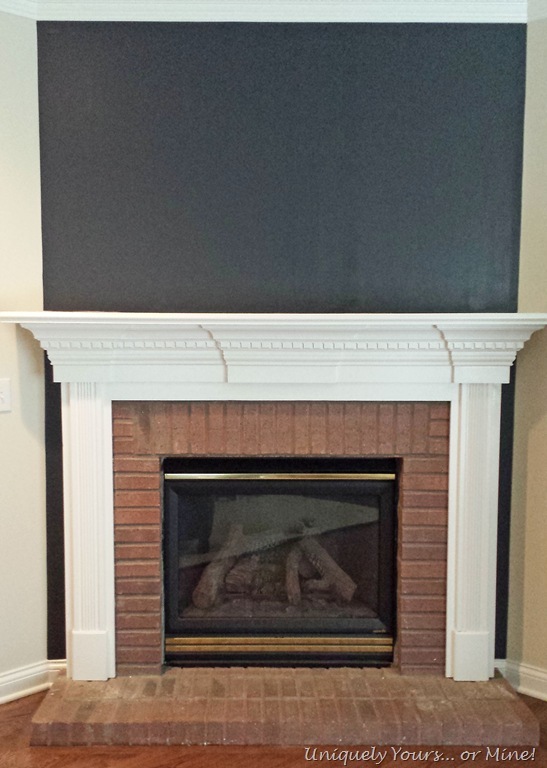 While I love the traditional molding and the brick work on the fireplace, the brass has got to go! I painted the wall Raccoon Fur (Benjamin Moore, Matte finish), it is a very dark gray / light black color. I have used the color before in a half bath so I knew I would love it. I taped off the edges/corners with Frog tape and then applied 2 coats of paint, a quick and easy change. 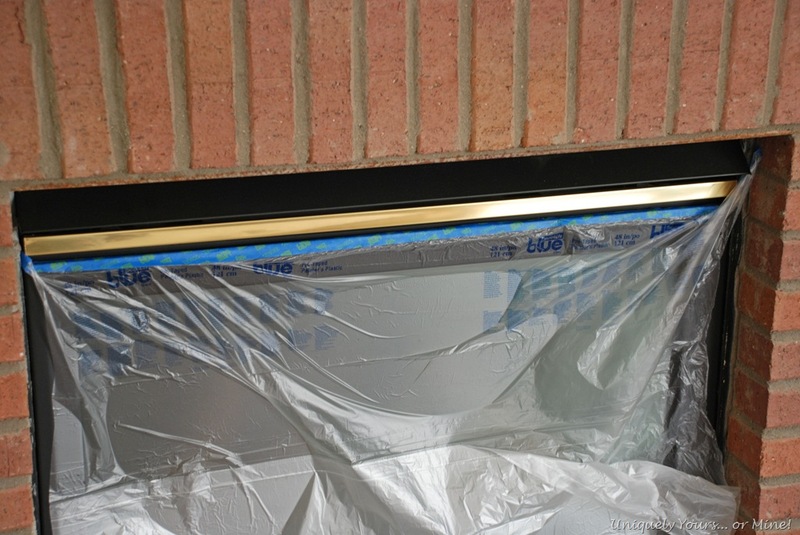 To paint the brass I first taped off and draped plastic over the glass. Doesn’t that look so much better already? 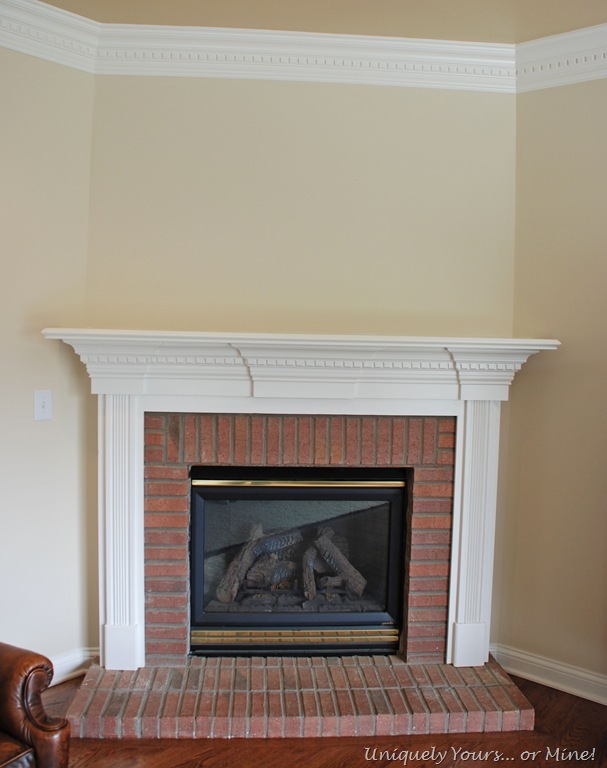 After that I did get a little “stuck”… I was thinking about applying a mortar wash to the brick, then maybe just white washing it, but I finally decided that I wanted to have a more clean classic look to it so I decided to just paint it the same white as the mantle. What I thought would be a quick paint job was not, you see I had forgotten how much of a pain it is to paint brick… lots of little nooks and crannies… I could have painted the whole room in the same amount of time it took me to paint the brick! 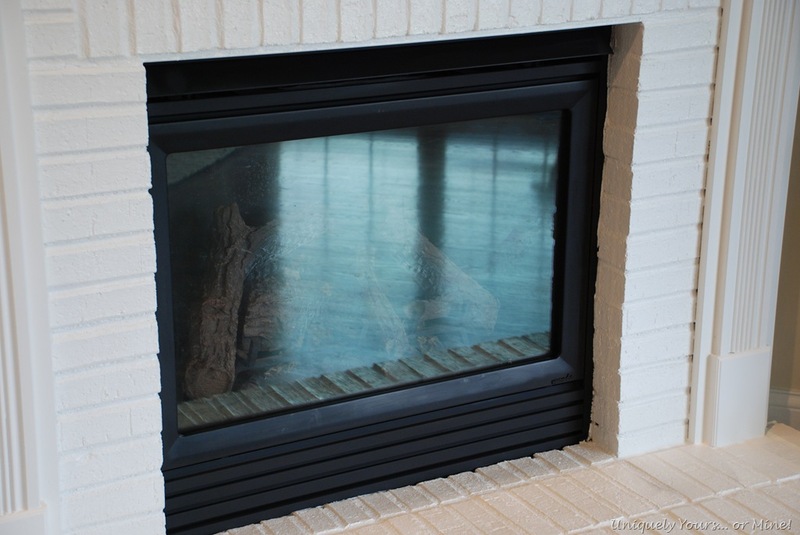 By the way I did tape off the fireplace surround and cover it to protect it from paint splatter… believe me this is a must no matter how neat of a painter you may be. When it was all done though I really loved the clean look of the white brick and mantle. A touch of silver against the dark gray backdrop really pops! So as you read above I am still working on narrowing down my paint color for the rest of the room, but first I have to paint the ceiling. It’s currently painted gold and it is making my color choices look really weird. Hopefully I can wrap this project up in a couple of weeks and share the finished room with you! As always thanks for stopping by and I hope you are enjoying some nice Fall weather! I’d love to hear your thoughts on this makeover so if you’d like please leave me a comment below! Previous Post: It’s Fall and Time For Planting! Just beautiful Susan! I have some brass that needs to go too. You’ve inspired me to get it done. 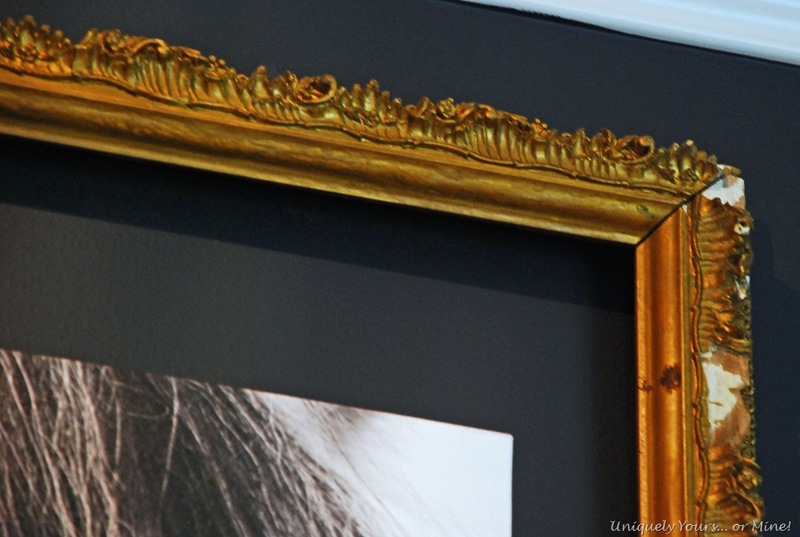 I love the white brick against the dark gray and the way you mounted the canvas with the vintage frame. 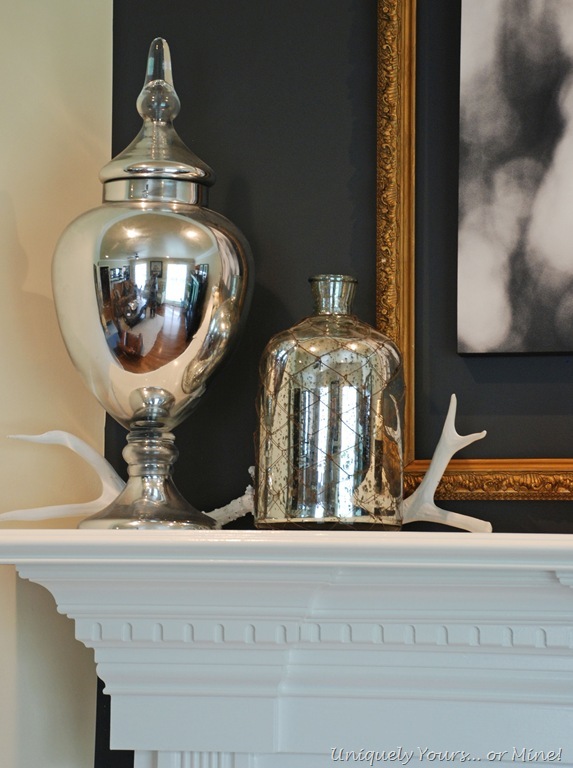 And the touches of silver just sparkle – nicely done! Sounds like you are settling in! Thanks so much Sharon, and yes I’m starting to start the decorating process but I’m hoping to find some fun stores locally! Looks great Susan. 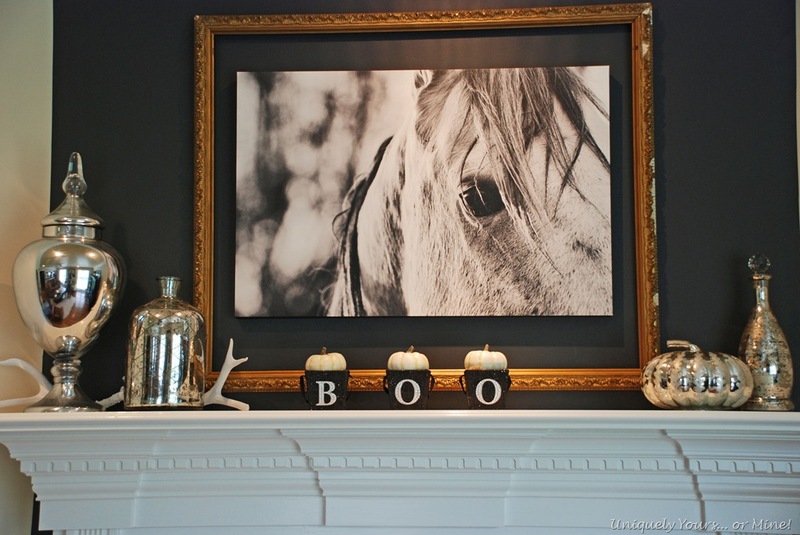 I LOVE that horse print! You must be a much better sprayer than I–I think I would have had it all over the brick! Can’t wait to see what you do with the rest of the room. Thanks Deb! I did have some overspray on the brick but I just touched it up carefully with the white paint. I’m very happy with the results! 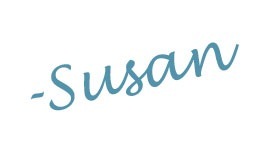 Hi Susan – this looks beautiful! 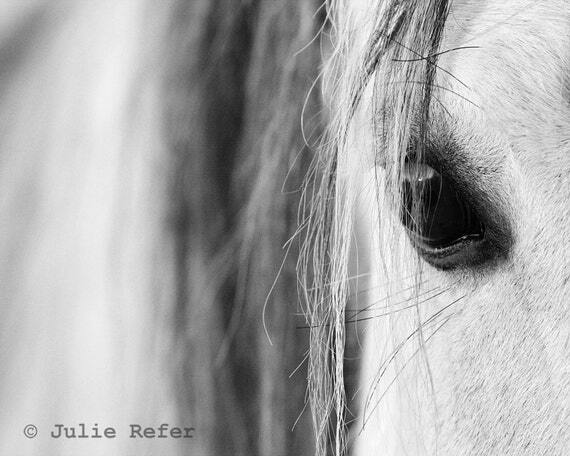 I’m gonna show the horse pic to my girls – they will love it! Hope you all are doing very well – we sure miss all of you in the hood! It still seems like ya’ll are just on vacation or something and will be back across the street soon – I wish! Can’t wait to see all the wonderful decorating things you do there – see you soon! A beautiful transformation. Love to watch how your projects unfold. I look forward to your next ‘reveal’ ! Thanks so much Michelle, hopefully I can pull the rest of the room together soon! Thanks Andi! I totally forgot to let Chewy in the shot 🙂 he does look a little mangy right now though, I think a bath is in order soon! Thanks Cynthia! I’m very much enjoying that little corner of the room now… just have to figure out the rest! Good luck and can’t wait to see! 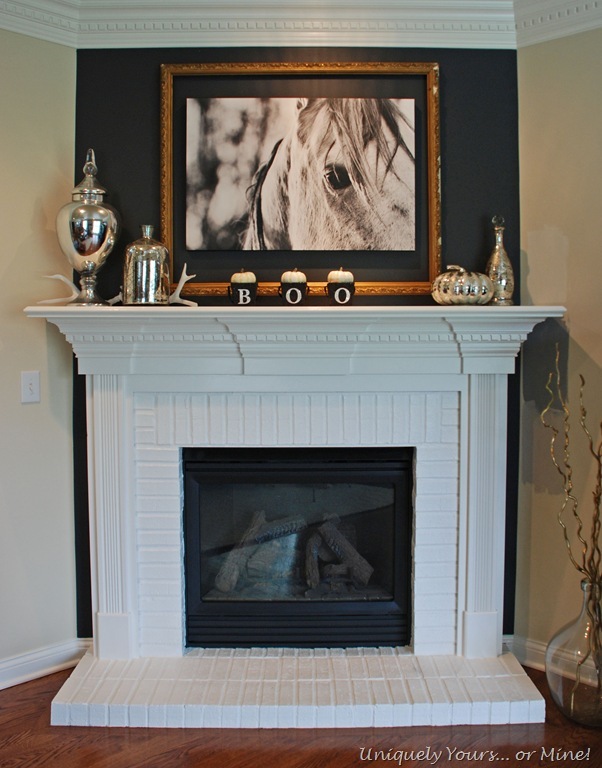 I’ve been meaning to tell you I love what you did with your fireplace. My own living room is almost identical to yours, including a brick fireplace in the corner. I’ve been begging my husband to let me paint the tired brick and he will have none of it. So, kudos to you! 🙂 It looks fantastic!